Powerade Development Meet #5 10:00 a.m.
FEBRUARY 2—A National Record in the Shot Put and an IAAF World Jr. Championships 200m qualifier for two 2013 Carifta Games silver medalists, highlighted the 5th BVI Athletics Association Development Series meet on Saturday at the A. O. Shirley Recreation Grounds. Two weeks after claiming the National Shot Put Record, Top Notch Track Club’s Trevia Gumbs cracked the 13m barrier in her pet event for the first time in her career, when she heaved the 4K ball 13.03m (42’9”). The mark eclipsed the 12.90 she threw on January 18. Pulled off the turn by Sprint Tech Track Club’s Tarika “Tinker Bell” Moses, Nelda Huggins of Top Notch Track Club powered to a season’s best 24.48 into a -2.7 meters per second headwind, becoming the territory’s first athlete to qualify for the IAAF World Junior Championships scheduled for July 22-27 in Eugene, Oregon. Moses finished second in a personal best of 24.82 seconds. On the front end of the sprint double, Huggins ran unchallenged and coasted 12.53 into a -3.3 headwind. Fast Lane Track Club’s Kyron McMaster made his U18 Boys 400m debut in 50.03 seconds then faced a -3.1 headwind in the 200m where he ran 22.71. Brittany Williams scored an U15 Girls 100/200m double, with times of 13.46 and 28.08 seconds, representing Top Notch Track Club. 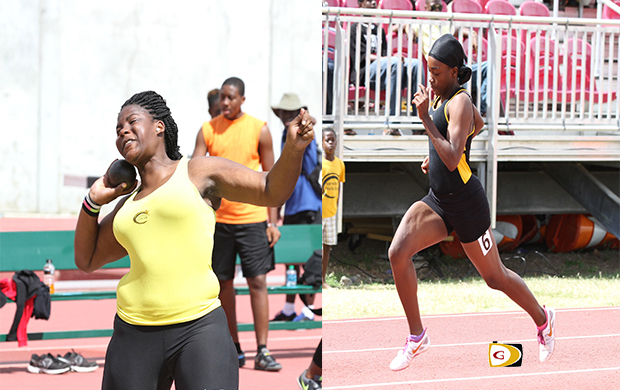 Fast Lane’s Zara Brown ended Xiomara “Gia” Malone’s double double streak while starting her own in the U13 Girls division, with respective times of 13.87 and 28.00 in the 100 and 200m. Mikkel Bassue Long Jumped 4.56m in the Fast Lane colors then ran 12.95 in the U15 Boys 100m. Jonothan Lynch recorded an Under 9 Boys 10.72/27.54 double in the 60/150m. Top Notch’s Izariah Frett picked up another U11 Girls triple with wins in the 80/150m in 11.56 (-2.0) and 21.52 (-3.4), then leapt 4.07m in the Long Jump. After winning the Boys Long Jump with a 4.28m leap, teammate Sha’eel Lavacia competing in the same division won the 80m into a -2.8 headwind in 11.29 and the 150m in 21.23 going into a -1.3 mps breeze. Ahead of the Feb 14 Johnny Hassan Relays, the next development meet is scheduled for 6:00 p.m. on Friday at the A. O. Shirley Recreation Grounds, targeting U-15 to open athletes. Running events start at 6:10. On Saturday, the second meet in Capoons Bay will be held for U9-U13 athletes. Competition begins at 3 pm.